Staying focused is virtually impossible without passion. Passion is a craving deep within us, that yearning for something we feel we just must have. It surfaces in a multitude of ways. For example, consider the story of Patrick (Pádraic) Henry Pearse. A friend of mine, the late Leonard Shatzkin, had a passion for mathematics that helped him become a pioneer in understanding the technicalities of inventory management. He developed a model of inventory control using linear regression that proved to be revolutionary for two companies he headed. But his passion didn’t just stop with benefits for his own organizations. Leonard then devoted the rest of his professional career to telling anyone who would listen about maximizing return on investment and minimizing overstocks. That’s what passion is like; one way or another it demands expression. Even after his death, the effects of Leonard’s passion live on. His ideas and systems serve many individuals and organizations well. Too often we allow old habits, the rigors of everyday life, and our ongoing fears or frustrations to impede our passion. We are cautioned by friends: “Don’t be so idealistic.” “Don’t be so daring.” “What if you fail?” These kinds of comments can shrink our passion so that we settle for working in fields away from our passion. We abandon it, we make do, and we play it safe. 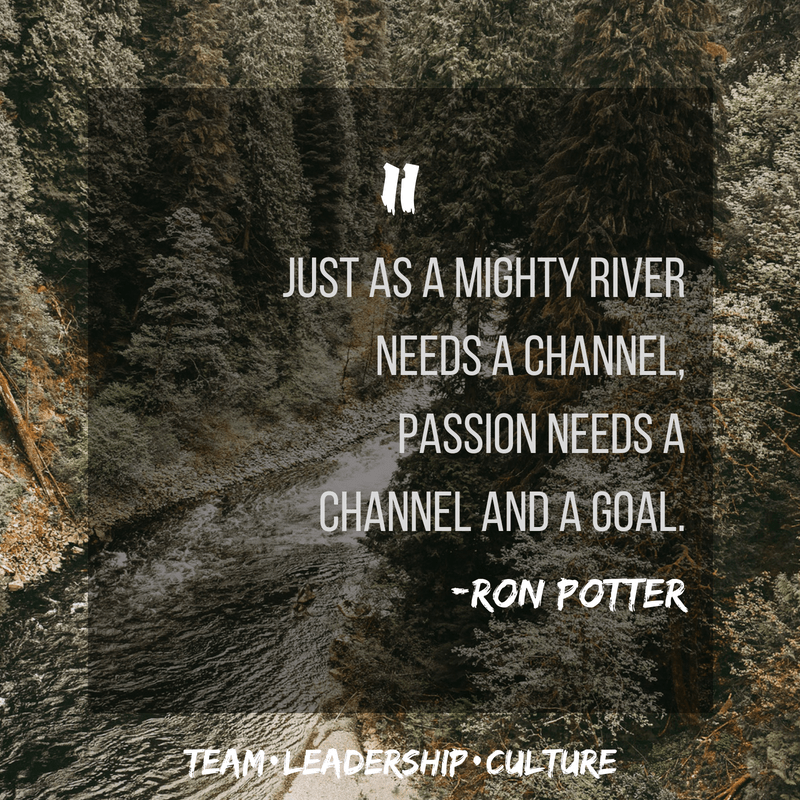 Just as a mighty river needs a channel, passion needs a channel and a goal. Without such restraint, the result is a flood, a natural disaster. You need to make certain that you control your passion, not the other way around. Dave and Charlie had been best friends for most of their lives. They had met in college and seemed to share common interests in both the classes they were taking and in the great outdoors. Both of them loved camping, hiking and most of all fishing. As their careers began their work took them in different directions but they used their outdoor activities to stay connected and would schedule at least one fishing trip together each year. Families began to grow and the distractions increased but their annual fishing trip was never abandoned. And then a wonderful thing happened about half way through their careers. All of a sudden they were working for the same company and ended up in the same city. As it turned out their children had all gone away to college and they had a bit more time to spend together and they took full advantage of it by adding some weekend outings and expanding their fishing adventures to all kinds of venues. You probably couldn’t find two guys more compatible then Dave and Charlie. They knew their similarities added to their mutual bond. Then one day Dave and Charlie ended up in one of my Myers-Briggs team building sessions. As I run the sessions I rearrange the people in the room around the conference table based on their positioning within each scale. This allows me to talk with those in the middle of the scale about their ability to adjust their behavior depending on the situation. It also allows me to talk with those who are solidly on one side or the other of the scale about how clear their preferences are and how they will default to those preferences in many situations and often without even much thought. It’s just natural. As we progressed through the scales of Energizing (Extraversion and Introversion) and the Attending/Perceiving functions, Dave and Charlie weren’t far apart and I could often see them exchanging knowing looks. Then we came to the deciding function, the one identified by Thinking and Feeling. Once we’ve taken in our information through either our Extraversion conversation or Introversion reflections and processed it through our Sensing attention to detail or our iNtuitive conceptual view, we then will decide. This Deciding function shows us how we approach decisions from either a very logical, practical angle or a Values based approach. While Thinking types will consider emotions and feelings as data to weigh their decisions will be made based on logic. And while the Feeling types will consider logic and objectivity as data to value, in the end they will make their decision based on values. Well now the dynamics between Dave and Charlie had changed. Dave was solidly on the Thinking side of the table and Charlie was well into the Feeling side of the table and Dave was staring at Charlie in utter disbelief. Can you guess how Charlie reacted? Did he truly belong on the Feeling side of this preference? Did Dave really not know Charlie after all of these years? In our next Myers-Briggs based blog we’ll continue the story of Dave and Charlie. Please join us. You might be surprised. Rob is a reader. You’ll almost always catch him getting in a few more pages while waiting for an airplane or waiting for the oil change on his car. He will often (sometimes too often) respond to an idea or a question with “I was just reading about that…”. Reading helps him think. Often after reading in the evening Rob goes to bed with ideas about how to apply what he has just learned to his work and personal life. Many times it will result in him rising back out of bed after 30 minutes or an hour to write down a few of the thoughts that clarified in his head. Usually to be followed by further thoughts as soon as he hits the shower in the morning. Rob not only reads, he takes notes. While reading he will often highlight key points and afterward collect all of those notes into a Word document that becomes his personal “cliff notes” on what he reads. Many of the people he works with have discovered this little treasure of book summaries and often ask Rob for a copy. Rob averages fifty plus books a year. Rob is a reader. Rob is also called upon to present ideas, concepts and mental models before his colleagues on many occasions. Teams that are exploring how to be more innovative or become more agile or face great change in their structure or market place will often use Rob’s insights to help them navigate an uncertain future. One such team even gave Rob the title of “Explorer/guide”. What do you think? Is Rob the reader an Extravert or Introvert? So, what do you think? Extravert or Introvert? In our next Myers-Briggs based blog we’ll continue the story of Rob the reader. Please join us. You might be surprised. Is Tom the talker an Extravert or Introvert? Spoiler alert!!! To fully appreciate this blog take just a minute and read our last post that sets the stage for understanding Tom. As we closed our last look at Tom we had just spent the day walking around one of Tom’s plants listening to him tell stories and respond quickly to problems presented to him. After all, Tom was the president, who else to better solve the problems that had been presented? But then we were headed to the next plant visit. So we buckled in and I remained quiet for a good half hour of our drive. At about that point in time Tom would get on his phone, give the plant manager a call and reverse about 70% of the decisions he had made on the spot while we had walked around the plant that day. Satisfied that the plant manager and he were now on the same page Tom would hang up. I had to ask Tom what had just transpired. Tom’s response, “Well now that I’ve had a chance to think about it, I believe the latest decisions are the best in the end.” When I asked him what was now going on back at the plant, his response was “Ron, I trust that team. I know that after they had time to think about it they probably came to the same conclusion that I did and I was just confirming with them that we were on the same page.” No Tom, they’ve been telling me how disruptive your visits are because they’ve been carrying out the decisions that were “made” during the walk around and now they’re trying to figure out how to reverse all those actions. Tom was an Introvert. Tom needed some quiet time to think about and process decisions. Tom was also a talker. Don’t assume that talkers are Extraverts. It may surprise you. We changed Tom’s whole routine. We still did the plant walkabout but when people tossed him an issue to solve he would say, “Give me some details and then let’s talk about it at the staff meeting later this afternoon.” Tom now had the time to think about the issues and speak more intelligently with his team about it “now that he’s had a chance to think about it.” Tom was an Introvert. It might surprise you. Tom is a real talker. A Scotsman by heritage he has that wonderful Scottish brogue which makes the stories even more enjoyable. Tom will tell stories almost all the time. They are humorous, often heartwarming, sometimes tragic but almost always educational. It seems like each time you hear one of Tom’s stories it penetrates your thinking almost instantly or sometimes even over a few days. But in the end, you always seem to learn something from Tom. You always come away with the impression that Tom is very wise, knows what is going on around him, a great teacher and most of all, a real talker. Tom was a client of mine and the president of a manufacturing company. During one great experience I had the opportunity to ride with Tom as we went on a little road trip to visit a few of his manufacturing plants. As we entered each plant you could see the reaction in almost everyone’s eyes as they saw Tom walk in the front door. Tom was in the building! We’ll be able to talk with Tom and his wisdom and answers will help solve many of the nagging issues of the day. Off on our plant walk we would go, Tom out in front, leading the way, greeting people as he went and telling stories. Always telling stories. Then I saw the problem-solving discussions begin. And so it went. Walking, storytelling, quick conversations, problems solved. Then we got in Tom’s car and headed off to another plant to repeat the scene the next day. What do you think? Is Tom the talker an Extravert or Introvert? In our next Myers-Briggs based blog we’ll continue the story of Tom the talker. Please join us. You might be surprised.